This iconic image of 1920s New York juxtaposes the prosaic everyday realities of life in the metropolis against the shining monolith of a modern skyscraper, as it sends forth beams of light into the sky like a beacon. Washing, including women’s nylons and socks, is strung high above the rooftops and between tenement windows, lit from within on a hot, still night. That quintessential signifier of the changing face of modern society – the flapper – is pictured facing the view in profile from her fire-escape, her modern dress and haircut as contemporary as the electrically-lit tower upon which she gazes. 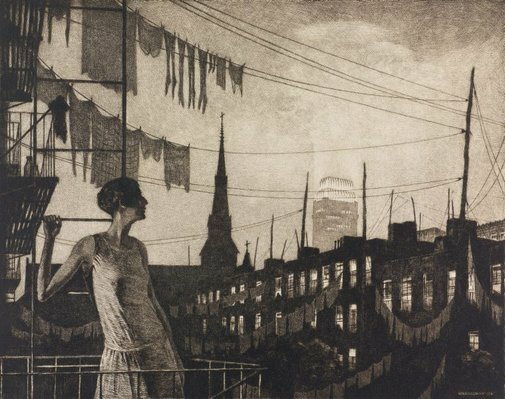 Martin Lewis was awarded the 1930 Print Circle of Philadelphia’s Charles M Lea Prize for this print. Identifiable in the image is the art deco Chanin Building, built in 1929, the same year the print was made; the steeple belongs to St Gabriel’s church, which was demolished in 1939 to make way for the Midtown Tunnel. The Chanin building was publicised at the time in a brochure that emphasised its light-power 'The tower of the Chanin Building is illuminated at night by great floodlights of 30,000,000 candlepower. Within a radius of thirty-five miles it is revealed as a man-made castle in the air – a landmark by night'. (ref: Paul McCarron, 'The prints of Martin Lewis', Bronxville, New York, pg.142). The building dominated the New York skyline for only a short time; within a year the Chrysler Building was completed just across the road, overtaking the Chanin Building in its reach for the sky. Signed on plate to print l.r.corner "MARTIN LEWIS". Signed l.r. below image, pencil "Martin Lewis - imp.". Anne Ryan., Look , 'Bright lights, big city', Sydney, Oct 2016, 19 (illus.). 'New Acquisition' article. Kirsten McKay, Martin Lewis: stepping into the light , Castlemaine, 2002, 23 (illus. ), 24. Modern masters of etching: Martin Lewis , London, 1931, 9, plate XII (illus.). The prints of Martin Lewis: a catalogue raisonné , Bronxville, 1995, Cover (illus. ), 142, 143 (illus.). Catalogue raisonne number 77.